.There aren't many things that warm the heart of a monorailist than a bright and shiney, brand new monorail! 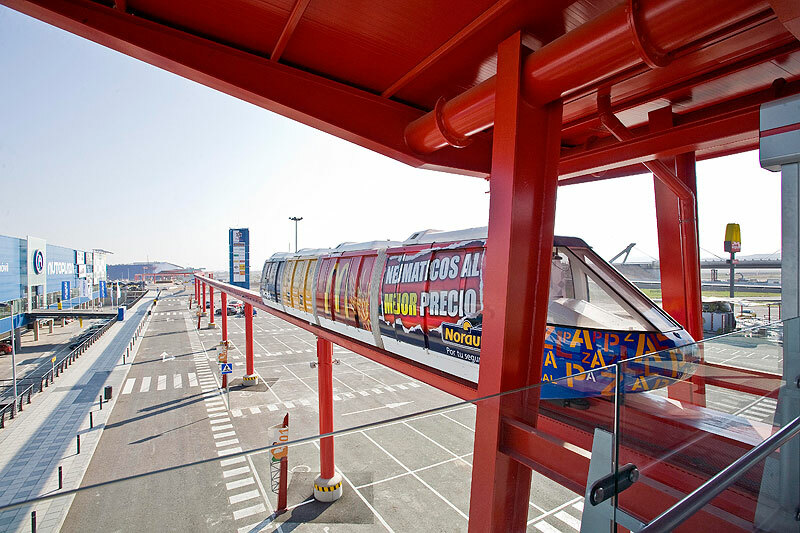 These images were shot shortly after the December 2008 opening of the Plaza Imperial Monorail, located outside of Zaragoza, Spain. 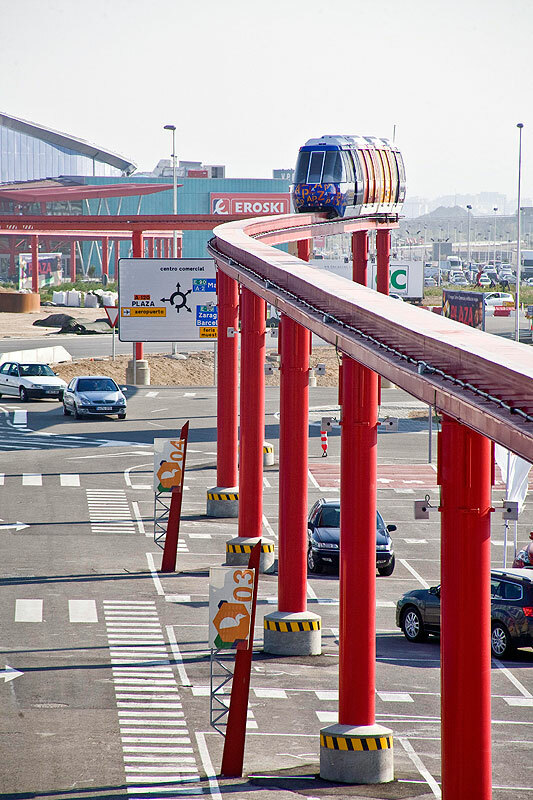 The 600-meter, single-track shuttle carries shoppers between parking and shopping areas and over a major thoroughfare. The very popular trend of wrapping transit vehicles in ads continues with Plaza Imperial's four-car train. Anyone hungry for some French Fries? The train was manufactured by Von Roll and originally used for Seville 92 World's Fair. Total capacity of the train is 36 passengers, plus 2 spaces for persons in wheelchairs. 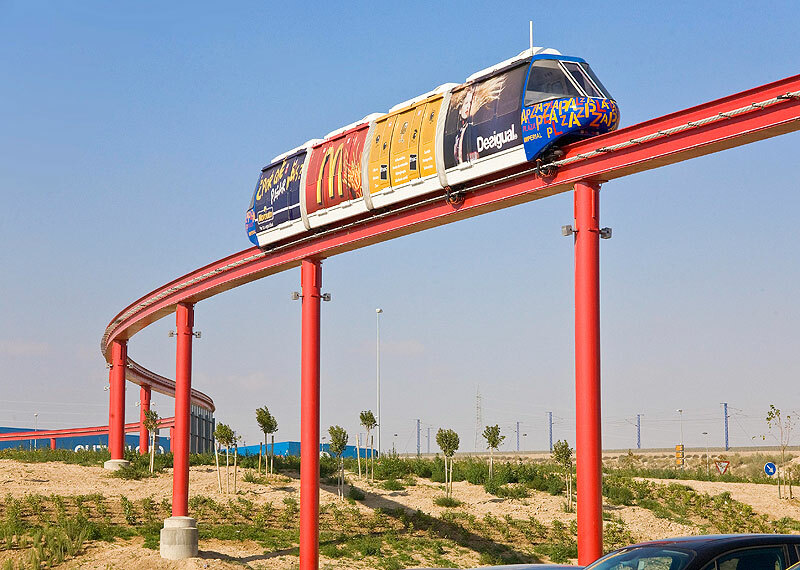 The line is capable of carrying 430 passengers per hour. 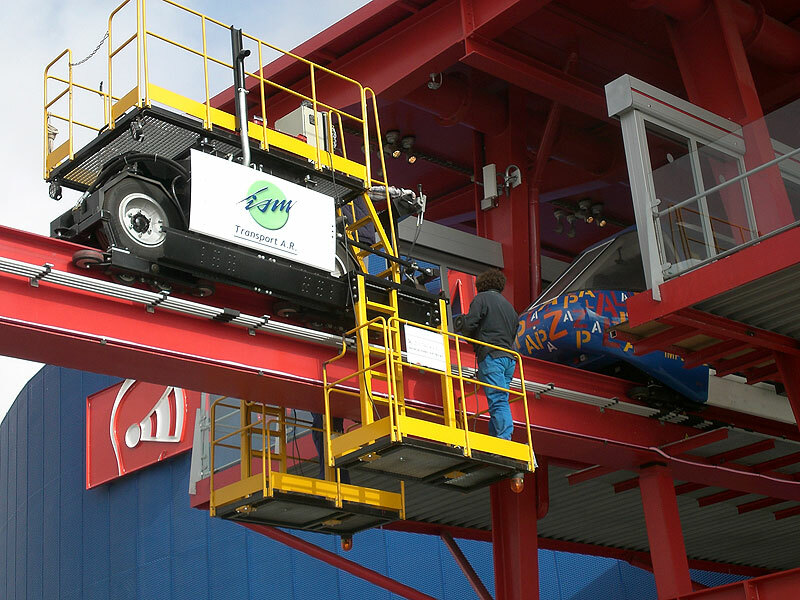 The system can be operated either manually or semi-automatically with an operator onboard. Plaza Imperial Monorail has its own maintenance and rescue vehicle. The vehicle's yellow platforms give maintenance personnel easy access to all portions of the beam for inspection and repair. In an emergency, the vehicle can be attached to the passenger train and push or pull it to either station. The maintenance/rescue vehicle is diesel-powered. The highest part of the alignment is six meters above the surface. The station to station journey only takes two and a half minutes. In a few years the Imperial Plaza's landscaping will be bigger and greener, and the monorail will look even better! Our sincere thanks to Roberto Franco and Ingeniería y Servicios de Montaña, S.A. for sharing these wonderful images.